Each order is for one full pound of treasure hunt mix. Dig in to a bag of Earth's rare treasures. Your treasure hunt will contain over 1000 polished gemstones as well as rare and valuable faceted gemstones. 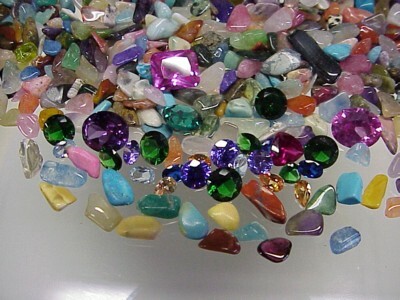 Each mix will contain the following gems: Alexandrite, Amethyst, Aquamarine, Beryl, Citrine, Emerald, Garnet, Iolite, Jade, Jasper, Lapis, Moontone, Peridot, Pyrite, Quartz, Rhodonite, Ruby, Sapphire, Spinel, Tanzanite, Tigereye, Topaz, Turquoise, and Zircon as well as many more. 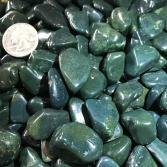 The faceted gems may be round, emerald, oval, trillion, pear, or heart shaped. Imagine searching through your very own bag of valuable gems. Each bag will contain faceted gems with a high combined retail value. The combined weight of these faceted gemstones will be 10 carats with the average gemstone weighing 1 carat or more, while the 1000+ polished gemstones will measure 3/8 inches or smaller in size. The fun of this is in searching through, cleaning, and sorting while looking for valuable gems. Each treasure hunt bag would make a great gift for children, the collector, investor, or anyone who loves gems or jewelry. If you are looking for a unique gift, you have found it.